A few miles from Mazunte, you’ll find the Mexican Turtle Center and Escobilla beach, where you can see the arrival of hundreds of thousand-year-old turtles to spawn and continue their way in the depths of the sea. The Mexican Turtle Center has different activities and tours to live the experience of helping the turtle release; one of the most amazing shows you’ll experience. At the western end of Mazunte is Punta Cometa, the most outstanding mountain in the Pacific. Its perfect location allows to contemplate the unforgettable sunsets and sunrises. So do not forget to bring your camera so you can capture the perfect pic! To arrive, you must do 20 minutes walk; once you reach the top, be prepared to relax and contemplate a memorable sight. Every year, Mazunte dresses up to host the most important forum in the promotion of jazz in Mexico: the International Jazz Festival. It takes place the third week of November and aside jazz music, you’ll find trova, reggae and rock artists, who convey all their assistants with energy. In addition, there are paint, crafts, gastronomy, dance exhibitions and multiple activities for you to enjoy the jazz festival with your partner or friends. If you practice water activities, San Agustinillo beach is ideal for surfing, as its strong waves will allow you to challenge your limits. 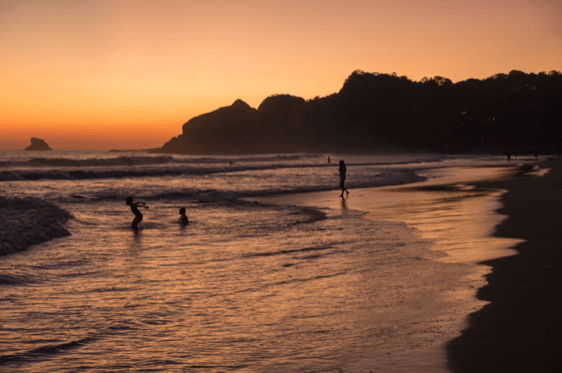 So get on a skimboard and catch the biggest wave; I bet you’ll want to stay forever in Mazunte. If you do not have a surfboard, you can rent equipment there. Mazunte is an ecological and sustainable destination, so it is inevitable to not visit the Cosmetics Factory. Here you will find a wide variety of oils, balms, soaps or creams. In addition, if you buy a product, you will help the local economy and the environment. Mazunte is very close to the beautiful beaches of San Agustinillo, Zipolite (nudist beach), Huatulco bays and Puerto Escondido, which are perfect for swimming, surfing, snorkeling or enjoying a romantic evening under the moonlight. Enjoy with your friends or partner a boat trip by the beautiful bay of Mazunte. During the tour, you can contemplate the tranquility of the Pacific Ocean and some marine beauties such as dolphins, whales and stingrays. If the weather is good, you can get off the boat to rest or to take a photo in the incredible reefs. Mazunte es un lugar con encanto que te envuelve en su naturaleza y sus hermosas playas. Su atmósfera relajada y atardeceres inolvidables hacen de este lugar, un paraíso terrenal. ¿Qué esperas para visitar Mazunte?